Studio Candice Lau offers a modern take on traditional leatherwork. These classic and bold minimalist leather bags are handcrafted by its maker using traditional methods with sensational results. Studio Candice Lau also prides itself on the functionality of their products, by honouring the needs of our ever mobile urban lifestyle. Studio Candice Lau brings has taken inspiration for a variety of different cultures (Amsterdam, Hong Kong and London), being inspired by their quirks and idiosyncrasies. All products are hand-crafted by founder, Candice Lau, who learnt the invaluable of pattern making and traditional saddlery work at the Alri Workshop in Hong Kong and the London School of Fashion. 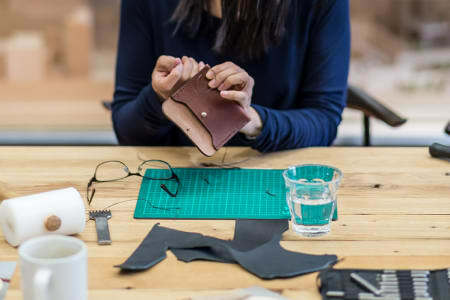 With the success of the brand experiencing vast growth, Candice proceeded to further challenge her creativity and skills by helping other brands to develop and create bespoke and unique leather pieces with her expertise in leatherwork. 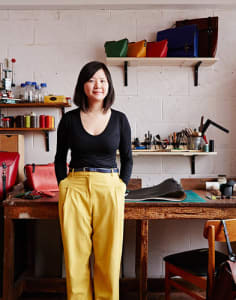 Candice continues to inspire and share her knowledge and skill set by teaching the art of leatherwork through her workshops in London, Hong Kong and Amsterdam.